Dozens of new character options for your campaign on the borderlands, including fighter and ranger archetypes like the explorer ranger and unicorn charger, bardic college, druid circles, warlock pacts and boons, and more! Over 20 spectacular spells and feats perfect for wilderness adventuring, like Fairy Blessing, shield of light, and dirge of the victorious knights! Over 60 incredible creatures, from friendly fey like pixies and satyrs to frightful foes like barrow wights to wendigos, plus forest dragons from taiga linnorms to jungle kongomato, and fanciful creatures like the jabberwock, jubjub bird, and frumious bandersnatch! Dozens of new magic items ideal for trailblazing in the wild, like the scout's spyglass, plow of the abundant harvest, and staff of the fey queen! Eight richly developed wilderness-themed characters are contained here as well, each with a detailed history and connections with one another but easily usable in any wilderness campaign as rivals or allies. Two complete adventures, with your heroes braving bloody vengeance among the barbarian tribes on Cold Mountain for 4th-level characters and saving unicorns from an unseelie fate in Horns of the Hunted for 6th-level PCs. Plus chapters on running forest- or fey-themed campaigns and building your own border kingdom in the wilderness, including love and bargains between mortals and the fey, the incursion of faerie magic into the natural world, tournaments and festivals, jousting and archery, villains in nature, and even sample kingdoms! If your heroes are heading into the woods, this richly detailed and lavishly illustrated book is a resource you don't want to be without! 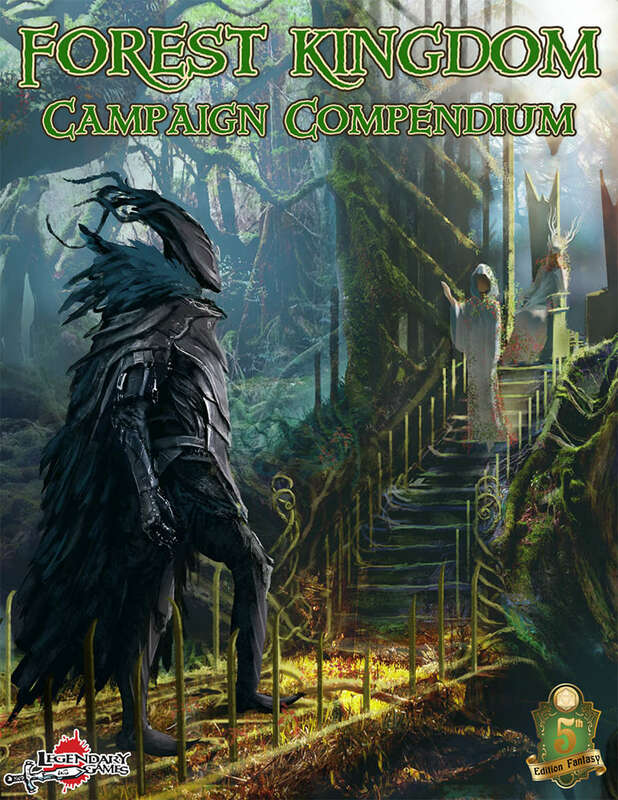 The Forest Kingdom Campaign Compendium is packed with great material for players and GMs alike, the perfect companion for any wilderness campaign to help Make Your Game Legendary! Is this just a compilation of all your pdfs or does it have extra content? Will you add a printed version for sell? We absolutely have a print version for sale, but because it was part of a full print run and not a print-on-demand book we cannot sell that print version here on DrivethruRPG. You can get it at the Legendary Games webstore, though! This title was added to our catalog on December 01, 2017.